The American Medical Association has found that physician practices aren’t using telehealth or telemedicine in large numbers, often because they’re having problems paying for the new technology. January 14, 2019 – Telemedicine and telehealth may be the norm rather than the exception in hospitals and health systems, but smaller medical practices still aren’t embracing connected care technology. A recent survey of some 3,500 physicians by the American Medical Association finds that roughly 15 percent are using telehealth in their practice for patient care, while just 11 percent are using telemedicine to communicate or consult with other healthcare providers. The findings, culled from the AMA’s 2016 Physician Practice Benchmark Survey and published in the December issue of Health Affairs, also indicate larger practices are more likely to use telehealth or mHealth. “This suggests that despite regulatory and legislative changes to encourage the use of telemedicine, the financial burden of implementing it may be a continuing barrier for small practices,” study co-authors Carol K. Kane, the AMA’s Director of Economic and Health Policy Research, and Kurt Gillis, PhD, the AMA’s principal economist in the Economic and Health Policy Research division, said in the study. Kane and Gillis found that provider-to-patient telehealth and provider-to-provider telemedicine were favored in particular pockets of healthcare delivery. Among those using connected care platforms to interact with patients, almost 40 percent are radiologists followed by psychiatrists (almost 28 percent) and cardiologists (roughly 24 percent). Radiologists (39.5 percent) have the highest use of telemedicine for patient interactions, followed by psychiatrists (27.8%), and cardiologists (24.1%). For those using the platform to connect with other providers, emergency medicine physicians came out on top at almost 39 percent, followed by pathologists (about 30 percent) and radiologists (25.5 percent). 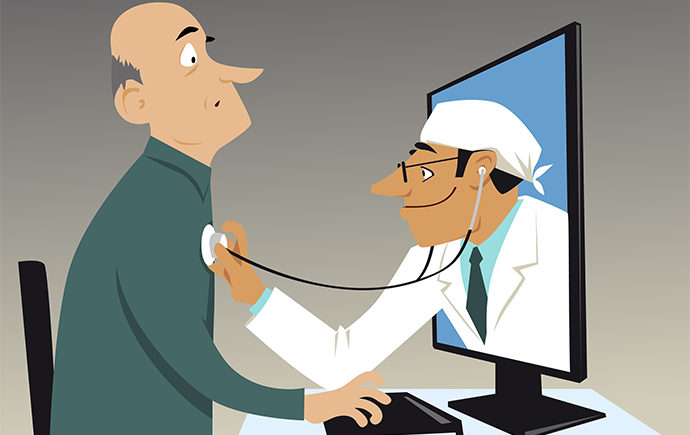 According to the survey, video-based telemedicine is the most popular modality, used by 12.6 percent of physicians. Of that group, almost 32 percent are emergency medicine physicians, followed by psychiatrists (almost 30 percent) and pathologists (about 24 percent). Asynchronous or store-and-forward telehealth is only being used by 9.4 percent of physicians, the survey found, and primarily by radiologists (almost 43 percent), pathologists (almost 23 percent) and cardiologists (about 15 percent). And while remote patient monitoring may be in the spotlight this year with new reimbursement opportunities from the Centers for Medicare & Medicaid Services (CMS), the survey found only 7.3 percent of physicians using RPM. The top users in this category are cardiologists (almost 18 percent), followed by nephrologists (a little more than 15 percent) and neurologists (almost 13 percent).